RE.BIN is the contemporary alternative to the traditional, boring recycling bin. Made of 100% recycled plastic, its design mimics the shape of a standard paper grocery bag. Consumers can use their paper grocery bags as a recyclable liner for their RE.BIN. Once it’s full, simply grab the paper bag liner on the way out the door! RE.BIN’s shape is perfect for people who are tight on space and short on time. Simply place your RE.BIN in your kitchen, living area or office for a visually pleasing, convenient recycling bin. RE.BIN is also the perfect size to fit inside a standard­ size kitchen cabinet. 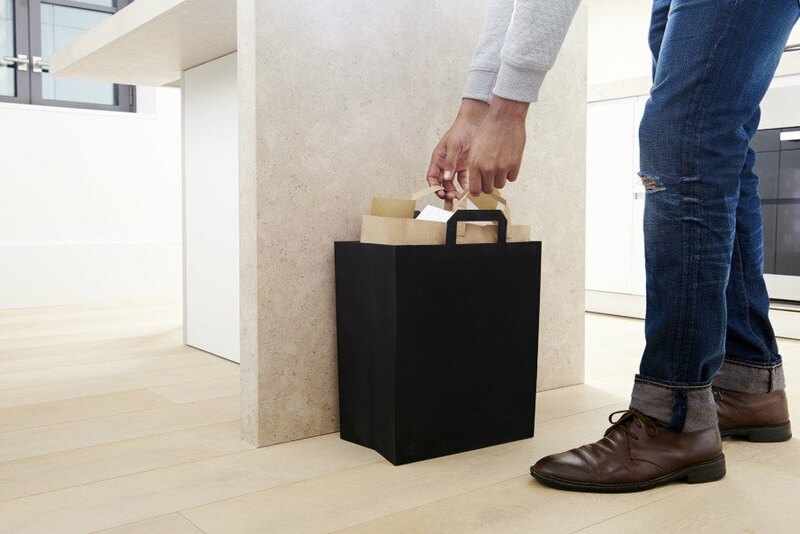 With RE.BIN, you won’t have to worry about bulky bins, and paper grocery bags will help keep your RE.BIN clean. wow, si sono inventati una busta. REBIN stylish paper bag recycling bin.